Careful With That Axe, Eugene: The only Irish channel on YouTube's Directory for Lifelong Learning! 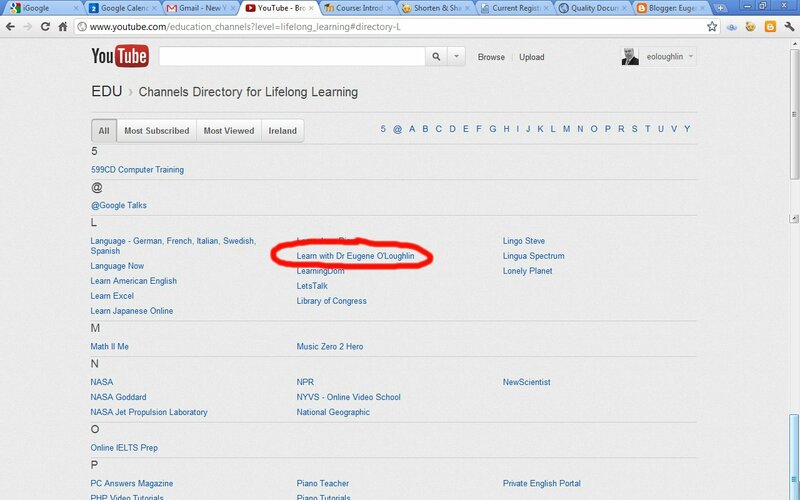 The only Irish channel on YouTube's Directory for Lifelong Learning! YouTube is getting its act together as far as Education Channels are concerned (must be the Google influence?). In the past few days I have been getting YouTube Partner updates telling me about new features and more Insight into who is viewing my Learn with YouTube channel. 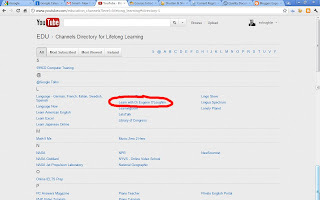 YouTube have set up a Lifelong Learning section in the Education category. There are 103 channels listed today at EDU › Channels Directory for Lifelong Learning, and guess what? My channel is one of the 103! YouTube have changed the name from Learn with YouTube to Learn with Dr Eugene O'Loughlin, so I have some work to do to in changing my Channel header and title. So far, this is the only channel listed from Ireland. I'm sure more will be added to this directory over time, but it's cool to be one of the first 100. My channel is at #72 for "Most Viewed" - a long way behind #1 which is the National Geographic Channel which has over 10 million views. I am also near the bottom at #99 for number of subscribers, also a long way behind the National Geographic which has over half a million subscribers. Given that these are figures for the whole world (not just Ireland) I am giving myself a small pat on the back today!